Institute for Healthcare Improvement founder and pediatrician Donald Berwick, M.D., on Monday was officially sworn in as CMS administrator even as Republicans blasted the move earlier in the day on the Senate floor. Berwick, who avoided a confirmation hearing in the Senate after President Barack Obama appointed the 63-year-old during the scheduled Independence Day break last week, took the oath in Boston. In one of his first acts as administrator, Berwick will be in Washington on Tuesday morning to help unveil final health information technology regulations. The move by Obama to skirt the confirmation process angered Republicans and some Democrats who are seen as pivotal in vetting administration picks. “This appointment had everything to do with the administration's fear of letting Americans hear (Berwick's) well-known views about government-run care and about how he plans to implement the president's plan to cut a half-trillion dollars from Medicare while limiting the choices seniors now enjoy,” Senate Minority Leader Mitch McConnell (R-Ky.) said during a speech on the Senate floor. Democrats Richard Durbin of Illinois and Sheldon Whitehouse of Rhode Island defended the choice of Berwick. 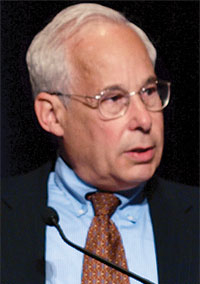 “Don Berwick is simply, hands down, the best person to do that,” he added.